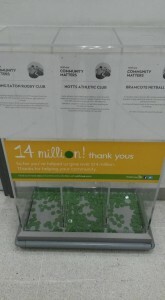 It gives me great pleasure to inform you all that Notts AC has been approved as one of the organisations to benefit from the Waitrose donations scheme at its wollaton store. All green discs put in the Notts box mean that we get a proportion of some cash. It’s only during April so please get down to the store and also tell your friends and family. Share this too. Thanks everyone.